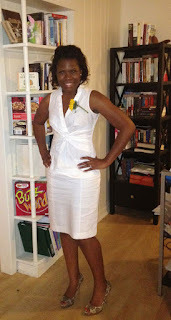 Reflections of a Bookaholic: Guess Who Just Graduated From Law School?!! Guess Who Just Graduated From Law School?!! I'm officially a 2012 Law School Graduate!! Congratulations ! Amazing accomplishment ! Congratulations! I know that must have been a lot of hard work! You look way too hot in that picture to be a lawyer! A TV lawyer maybe, LOL. Good luck girl! Thats awesome! Wow - CONGRATULATIONS!!!!! What an awesome accomplishment! Congrats!! We're so happy for you. Congrats! Now on to bigger and better things! Oh wow, congrats!! I would hate to wear all white, but you look great. I know! I think I would have felt more accomplished or special in a cap and gown. YAY! *Throws confetti* What kind of law did you study? I like your shoes. Are they leopard print? CONGRATULATIONS! That's such a huge accomplishment! One of my very good friends just finished her undergraduate degree and is starting law school this fall, and I know she's going to be in for one heck of a ride! Oh it is definitely a roller coaster ride, but it will fly by. Congratulations Chica!! Whoot! Whoot! Or should I say Alexis esq. I love it! Now let's talk about those shoes. I love them. They are my favorite and I got them super cheap from Nine West. I was inspired. Cheap and Cute!! Love it! Congratulations! By the way, your shoes are too cute!! Thanks. These are my faves right now. You look so pretty! Congratulations Alexis, what an accomplishment! You look gorgeous my friend! Congratulations! What a huge accomplishment!